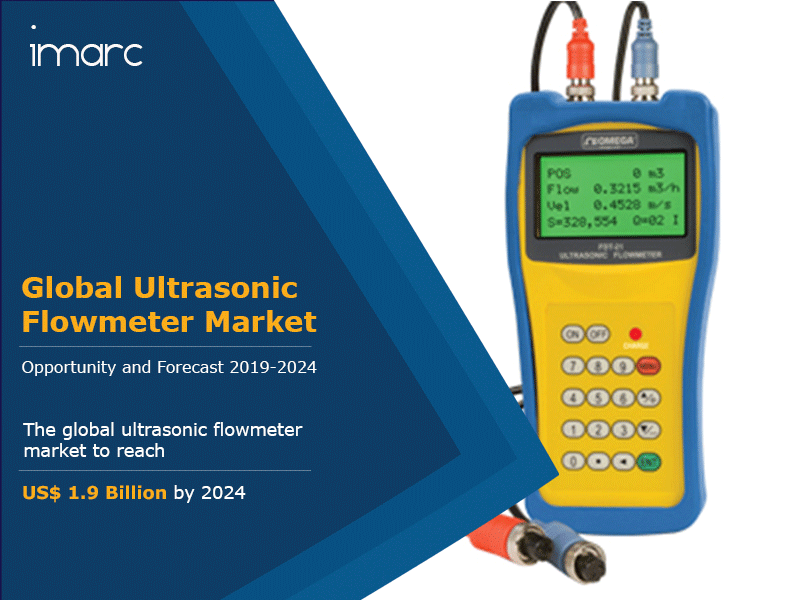 The global ultrasonic flowmeter market was worth around US$ 1.2 Billion in 2018. An ultrasonic flowmeter is a device that is used to measure the quantity of a liquid or gas that is moving through a pipe. The device measures the fluid velocity which further calculates the motion of gas or any liquid flowing. The velocity of the material flowing is measured with the help of ultrasonic transducers. Along with liquid, one can also measure the velocity of molten sulphur, chemicals, cryogenic liquids and even gases. This device generally works on three different principles namely transit time difference, doppler effect principle, and open channel principle. Ultrasonic flowmeters are mainly used in industries like wastewater, chemical, food and beverages, mining, metals, pharmaceuticals, power generation, paper and pulp industry, etc. The accuracy of the ultrasonic flowmeters in taking measurements and calculating the velocity of the fluids is a key factor that is driving its demand. The high efficiency and accuracy of ultrasonic flowmeters can be attributed to the fact that they do not suffer mechanical wear and tear, do not cause a drop in the pressure of the fluid flowing through the pipe, and can be used for bidirectional measurements as well. Ultrasonic flowmeters are playing a major role in making bidirectional measurements that can be done with clamp-on flowmeters. Another major factor that is driving the demand of ultrasonic flowmeters is their non-invasive nature. These flowmeters do not require to come in contact with the fluid or involve cutting of the pipe in order to take the measurements. They are highly accurate, reliable and require low-maintenance. Moreover, the rising number of refineries catalyzed by increasing energy demand is also driving the demand of ultrasonic flow meters. Looking forward, the market value is projected to reach US$ 1.9 Billion by 2024, expanding at a CAGR of 8.6% during 2019-2024. Based on the product type, the market has been segmented into spool piece, insertion, Clamp-On and others. The spool piece segment currently represents the largest segment. Based on the number of paths, the market has been segmented into 3-path transit time, 4- path transit time, 5- Path transit time and 6 or more path transit time. Based on the technology, the market has been segmented into transit time - single/dual path, transit time – multipath, doppler and hybrid. Based on the distribution channel, the market has been segmented into direct sales, independent representatives, distributors and online. On the basis of application, natural gas represents the largest segment. Other segments include non-petroleum liquid, petroleum liquid, and others. Region-wise, the market has been segmented into Asia Pacific, North America, Europe, Middle East and Africa, and Latin America. Amongst these, Europe is the leading market, accounting for the majority of the global share. The competitive landscape of the market has also been examined with some of the key players being Asea Brown Boveri Ltd., Badger Meter Inc., Emerson Electric Co., Emerson Process Management, Faure Herman SA, General Electric, Hach/Marsh McBirney Inc., Honeywell International Inc., Index Corporation, Invensys Process Systems, Rockwell Automation Inc., Siemens AG, Teledyne Isco Inc., Yamatake Co. and Yokogawa Electric Co. This report provides a deep insight into the global ultrasonic flowmeter market covering all its essential aspects. This ranges from macro overview of the market to micro details of the industry performance, recent trends, key market drivers and challenges, SWOT analysis, Porter’s five forces analysis, value chain analysis, etc. This report is a must-read for entrepreneurs, investors, researchers, consultants, business strategists, and all those who have any kind of stake or are planning to foray into the ultrasonic flowmeter market in any manner. How has the global ultrasonic flowmeter market performed so far and how will it perform in the coming years? What are the key regional markets in the global ultrasonic flowmeter market? What is the breakup of the global ultrasonic flowmeter market on the basis of product types? What is the breakup of the global ultrasonic flowmeter market on the basis of number of paths? What is the breakup of the global ultrasonic flowmeter market on the basis of technology? What is the breakup of the global ultrasonic flowmeter market on the basis of distribution channel? What is the breakup of the global ultrasonic flowmeter market on the basis of applications? What are the various stages in the value chain of the global ultrasonic flowmeter market? What are the key driving factors and challenges in the global ultrasonic flowmeter market? What is the structure of the global ultrasonic flowmeter market and who are the key players? What is the degree of competition in the global ultrasonic flowmeter market? How are ultrasonic flowmeters manufactured? 13.3.1 Asea Brown Boveri Ltd.